It's great to be in the Texas Hill Country, especially at this time of year...spring wildflower season is just ahead. So pretty here, gentle rolling hills, and natural beauty everywhere. This is ranch and cowboy country...horses, cows, goats, and sheep abound..it's also steeped in Texas history. We're looking forward to exploring this vast area of central Texas. I'll be adding to the photo gallery Totally Texas while we're here. Check back regularly for the latest additions. This is our last full day on the Texas coast…this past month has really flown by! The island swagger was a real nice change and we’ve really stayed busy chasing down and capturing wildlife, beach scenes, sunrises and sunsets…our tan lines, mosquito and chigger bites prove it! We had great success in capturing photos of the endangered whooping cranes, brown (and white) pelicans and so much more! Check them out! Pick up one or more images today, for yourself or for a gift. Now it’s time to saddle up this big machine, spur it north and wade knee deep into Texas culture, cowboy (and cowgirl) fare, bluebonnets and wildflowers! Can I get a big Yee Haw? We’ll be camped out in Fredericksburg while we explore new trails and bring you exciting photos from the Texas Hill Country! As always, you are very much appreciated! Your gracious support helps keep us moving and shooting. God bless! We’ve left San Marcos behind, and we’re now in Port Aransas, Texas. Ahhhhh…mid-70’s, blue skies and a nice sea breeze. The warm salt air brings back good memories from previous time spent here. Always fun and a friendly place to be. Our main purpose for this visit is to photograph the whooping cranes, American brown pelicans and other birds that winter here on the Texas coast. We're also hoping to capture some great Gulf of Mexico sunrise shots, seashells, and other coastal wildlife that may come our way. Wish us good luck! If you’ve loved the photos from our north and western adventure this year, I’d like to encourage you to click on Photo Galleries, explore a bit, and pick up one or more prints, for yourself or for a gift! I’ve been busy adding more images to the website than what has been seen on Facebook, so there’s something special for everyone! And just in time for holiday gift giving, Jana and I are offering to our wonderful friends and family, a 25% off coupon on all prints and wall art, good through 28 December. Just use the coupon code SaveNow at checkout to apply this great savings! We know that you’ll be very pleased with your order. In addition to the already wonderful paper prints and finishes, professional wall canvas prints, fantastic thin wraps and absolutely stunning metal prints, I’m now offering two new exciting print choices to the lineup. Acrylic covered Metal Prints and Maple Wood Prints. Whatever your selection, you’re sure to be proud of your gifts to others or to enjoy your choice of art personally into the coming year and for many years to come! Jana and I sincerely appreciate you following our travels this year and thank you in advance for supporting our efforts to continue to bring you more images to view. God bless you…happy holidays and a very merry Christmas! After 8 months of traveling and visiting 20 states, we're back in the Dallas area to visit with family and friends for the remainder of the fall season and the upcoming holidays. It's been such a grand adventure this year experiencing the southwest, west and northwest states of this great nation! We've seen and photographed so much, experienced new and old roads, trails and paths, met so many interesting people, and made lasting friends along the way. Our motor coach/bus (Freedom Won) and SUV (Liberty Too) survived the 11,000+ miles in great shape, but could use a little rest and TLC...Jana and I as well! But, even so, the photography will continue through the holidays...I'll be adding to this website regularly, so check back to see the latest seasonal updates! Thanks again for following our journey...we sincerely appreciate you all! Greetings from Estes Park and Rocky Mountain National Park. We always enjoy coming here....the picturesque scenery, the majestic wildlife, the small quaint towns, the charming little specialty shops, the deep blue skies and crisp mountain air. It’s the type of place that gives you real purpose to relax and at the same time, energizes and makes you want to turn it up a notch and go see and do more! 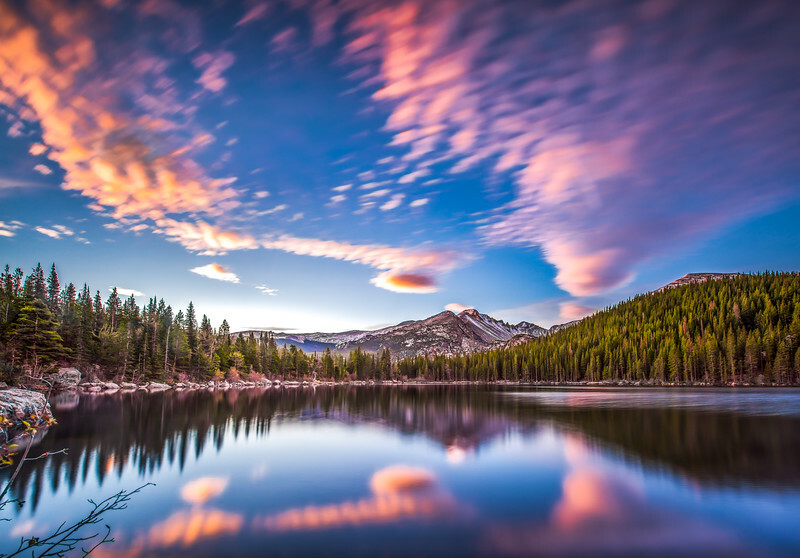 Below is a scene from Bear Lake inside the park at an elevation of 9,450 ft...taken at sunrise on a cold crisp morning. Standing behind the camera I found myself humming an appropriate verse from a John Denver song..."Deep inside the forest there's a door into a another land..."
We've moved on to Grand Teton National Park. We love this area...so much to see and do! Fall color is at it's peak and oh, so beautiful! 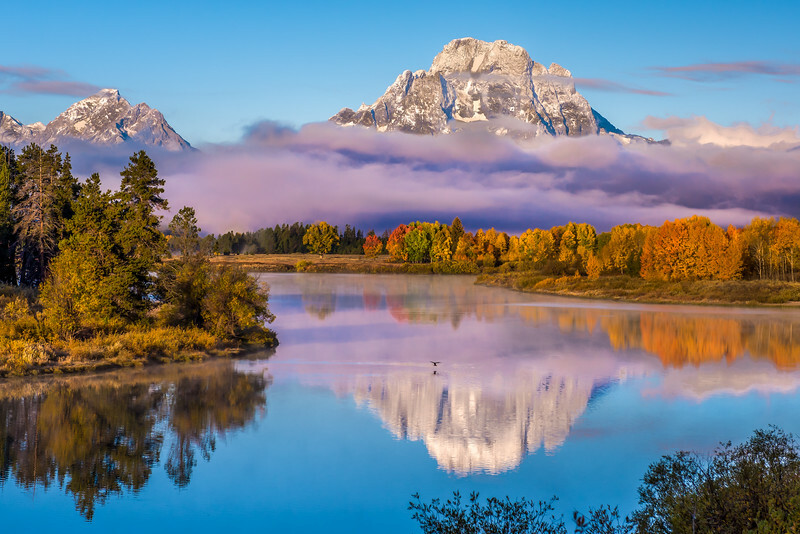 Below is a sunrise shot of Oxbow Bend on the Snake River. A lone duck makes a decent to land on the river in the reflection of Mount Moran. We've arrived in Yellowstone National Park, one of our favorite places in North America! 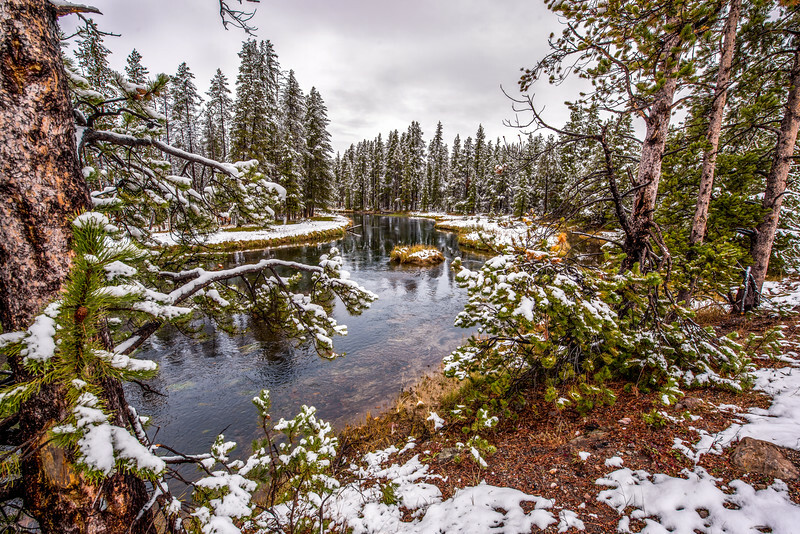 Greeted by an early mid-September covering of snow, we took advantage of this fleeting frosting of white to explore the park early the next morning and capture its beauty! Below is a scene from the Gibbon River and surrounding forest. This truly is a special place! The temps have warmed a bit now and most of the snow has melted, but it still remains on the high hills and the mountains, reminding us of our Yellowstone greeting and adding the perfect touch to our images. We'll be here several more days, exploring, capturing the wildlife during this seasonal change, and other scenic vistas. Keep following to see the latest! We've left Oregon behind and moved on down the road. As much as we would've loved to have seen more of Oregon (especially around the Bend area), we need to stay on our RV park and shooting schedule. So it's on to Montana via Idaho. We're currently in south central Idaho, stopping briefly to enjoy and shoot some of the beautiful waterfalls and scenery along the Snake River and the scenic byways. Pictured here is Perrine Coulee Falls. The days are getting shorter and have been progressively cooler. After a day of thundershowers we woke up this morning to clear skies and cool crisp lower 40's. Summer is definitely over and fall is already starting to show its colors. 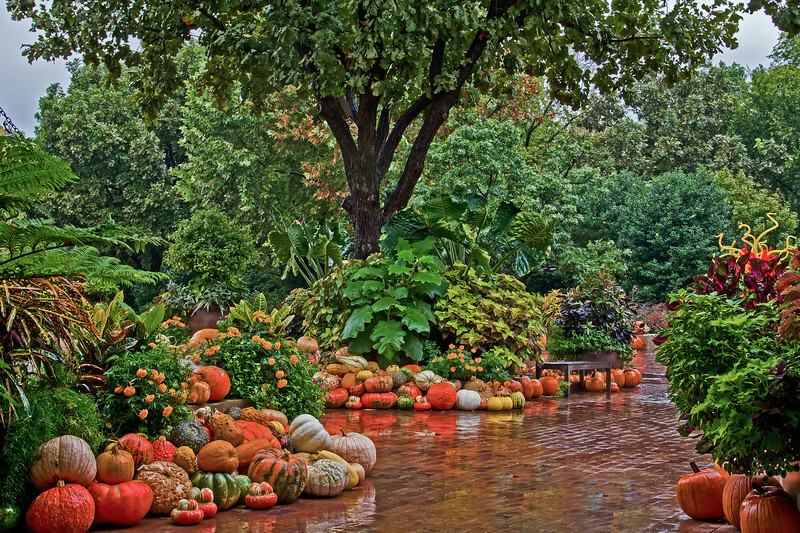 I love this time of year and the change of seasons. We can hardly wait to capture its glory and share it with you! 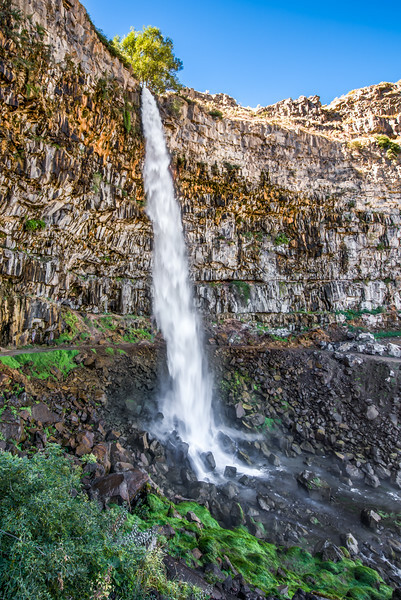 Jana and I are currently photographing the some of the many beautiful waterfalls throughout the Columbia River Gorge. The mountains, the streams and fern forests here are amazing! The Columbia River Gorge is a canyon up to 4,000 feet deep, and stretches for over 80 miles as the Columbia River winds westward through the Cascade range and the Gorge forming the boundary between the state of Washington to the north and Oregon to the south. 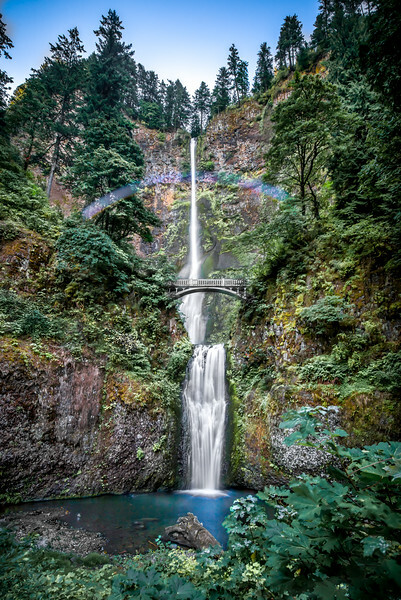 The Gorge is a temperate rain forest and is known for its high concentration of waterfalls with over 90 on the Oregon side of the Gorge alone, including the amazing 620-foot high Multnomah Falls. I was fortunate to capture a rare event at these falls...a Moonbow (like a rainbow during the day, except the moon produces the light instead of the sun). Arriving at the falls before daybreak, I set up and began shooting a long exposure just as the moon was setting and dawn was breaking. The conditions and timing were perfect to allow me this shot...the right amount of spray from the falls and the right amount of wind to produce the mist and create the prism, the setting moon in just the right position to stream the light and bathe the falls, and a long exposure to show off the beautiful spectrum of color. So happy to have captured it and share it with you!